name 5 things. : Sarah's Summer House. It's no secret I'm a big fan of Sarah Richardson. I know I'm a little behind on blogging about it, but I was thrilled when I heard that Sarah's Summer House was going to be on HGTV. How amazing is the living room? It's almost like you are sitting out in the middle of the water with all of those windows overlooking the fantastic views. I love that she used a bunch of different shades of blue in all different patterns. I was thinking it may be too busy, but of course, it wasn't. It all came together so beautifully (as usual for Sarah's rooms). Those blue Chiang Mai Dragon ottomans are amazing! I would love to put a little Chiang Mai Dragon fabric somewhere in our house. I couldn't post about the CMD in Sarah's living room without mentioning this fab powder room makeover over at Hazardous Design where the blue Chiang Mai Dragon wallpaper is a showstopper. Seriously, this may be one of my favorite powder rooms ever. Every detail is just perfection (the lighting, the mirror, the floors, the beadboard, the monogrammed towel, the hardware, the pink flower). Stunning, isn't it? And speaking of great bathrooms, the one on Sarah's Summer House was fabulous too. It has such a clean fresh feeling. Are you watching the show? Are you as obsessed with Sarah and Tommy as I am? P.S. Hope y'all had a wonderful Memorial Day weekend. We headed to New Orleans on Friday with a group of friends. We spent part of Monday recovering and part of it grilling and hanging out by the pool. Love Sarah Richardson and that bathroom is amazing! I haven't been watching the show but I need to start. Her style is so polished but relaxed; its great, isn't it?! oh wow, that living room and bathroom is to die! We are getting ready to remodel our bathrooms, so this is some great inspiration!!! Hope you had a great Memorial Weekend!!! Sarah and Tommy are the best. Wouldn't it be amazing to have a summer get-away like this one??? Gorgeous! and man oh man what a view. I think I could hang out there for the summer :). Ahhh, beautiful. If I love anyone more than Sarah, it is Tommy. They are so great together. Obsessed doesn't really cover how I feel about Sarah and Tommy...if I could be besties with anyone on the planet, it would probably be those two! And I am so much in love with Carrie's powder room...it is completely pitch perfect to me, too! Genius. Hope you had a great weekend my dear! I don't even know where to begin. Honestly. That first photo is beyond. I LOVE it all. I am also obsessed with them. Whenever my hubby suggests something on the cheaper side, I totally quote Tommy and say something obnoxious like, "Ugh . . .I just can't make it work for less than $5,000." He is priceless. I love those two! Having said that, this house is not my favorite of her work. Its a bit more cottage-y than I like. Yes, its a cottage, I know. Just not quite my style. But watching Tommy ride in on a septic tank is worth it. Every time i watch her show, though, I think that she and her husband must make a gazillion dollars apiece. She is always saying "well, I'm only $40,000 over budget, but you just can't skimp on good design." 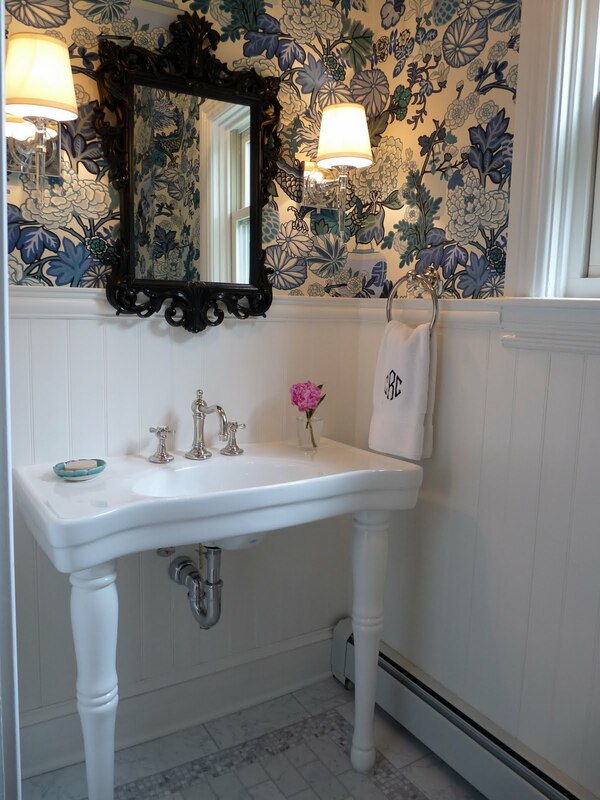 Don't you think Carrie's bathroom would be perfect in Sarah's cottage? Beautiful! I think you are one of the people who got me hooked on Sarah and Tommy! They are so talented and a great pair- fun to watch! And I learn so much from them on every show- that summer house is just Beyond!!!! I love watching that show and was so excited to see Sarah and Tommy back on HGTV together! They are such a great team. The new summer house show is amazing! 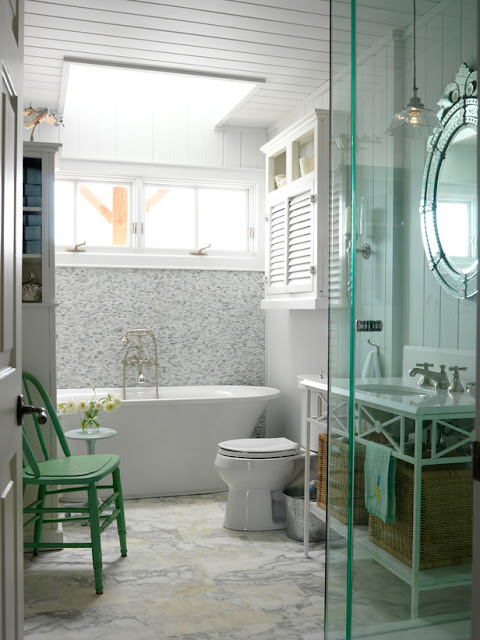 And I also follow Carrie's blog and love her new bathroom makeover. They did a great job! :) Glad you had a great Memorial Day weekend! I love Sarah and I love her and Tommy together (: Can't wait to get home to watch their show! She's one of my favorite designers ever! She's so inspiring! Love the mirror in that bathroom! I LOVE Sarah Richardson- I just found this show a week ago or so too. Now I am recording it, the regular Sarah's House and Design, Inc another one of her shows. She and Tommy are so funny together and so fun to watch. She can do no wrong in my book LOVE HER! Oh and that Chiang Mai Dragon wallpaper in the bathroom is AMAZING. I think I'm getting some pillows made in the aqaumarine color! 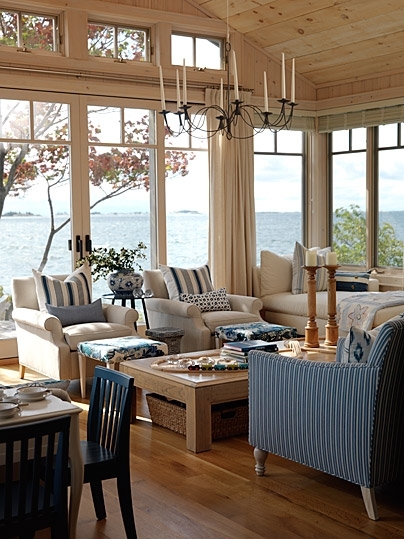 I'm also a Sarah Richardson fan, but hadn't seen these images of her house. They're gorgeous -- thanks for sharing! Really love the feel of the room, especially those huge clear windows. 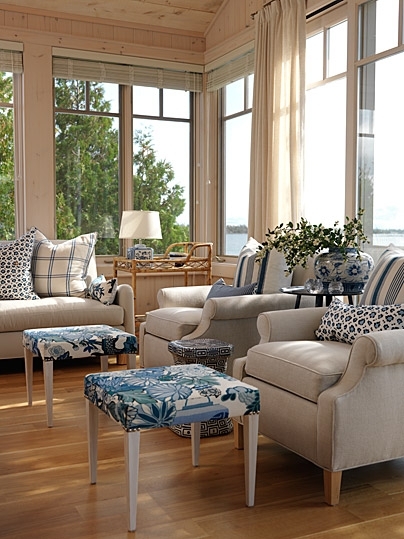 It gives the area that sunroom feel! And just by opening those double doors, you can let in the smell of the sea into the house.